Location: Angers, in the Maine-et-Loire departement of France (Pays de la Loire Region). 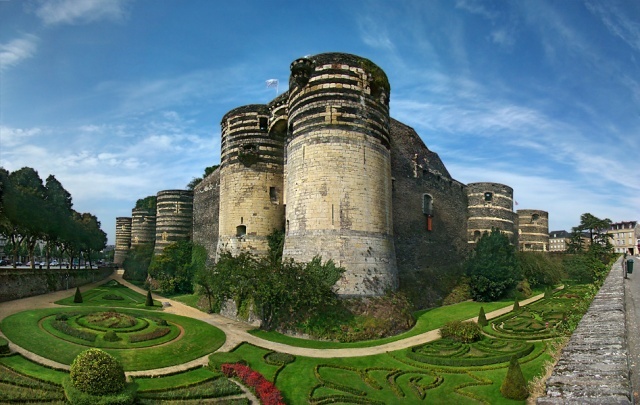 Notes: Château d'Angers, also called castle of the Dukes of Anjou, is located in the city of Angers in the department of Maine-et-Loire in France. The fortress is built on a slate promontory that dominates the Maine. The site has been occupied since ancient times because of its strategic defensive position. Thereafter, the counts of Anjou settled their homes until the end of the Plantagenet empire that sees the kingdom of France to conquer the county of Anjou. Louis IX built the present castle in the thirteenth century while the Dukes of Anjou transform the stately residence in the fifteenth century. Yolande of Aragon gives rise to Rene d'Anjou. In the seventeenth century, following the troubles of the religious wars, the king ordered the destruction of the castle, but only the upper part of the tower is destroyed. It was later turned into a prison, then in garrison and ammunition depot during World War II. In the early twenty-first century, it houses the Apocalypse tapestry and is one of the most visited tourist sites in Maine-et-Loire. It opened to tourism is managed by the National Monuments Centre.